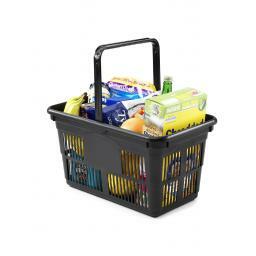 A standard rectangular shopping basket manufactured in the UK from high quality materials for longevity. The single comfortable handle locks in the upright position making it very easy for shoppers to place on the floor and pick up again. 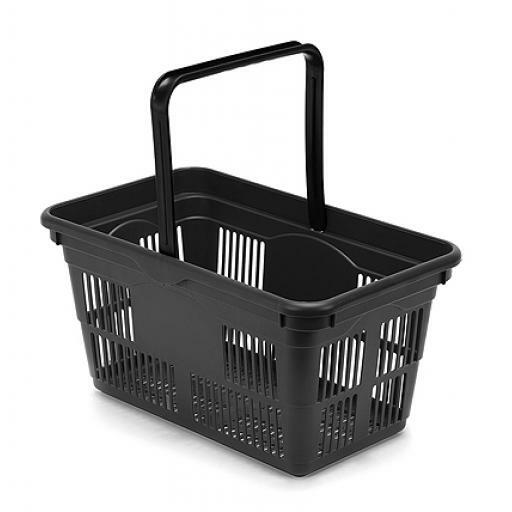 The sides are gently tapered making sure there is the maximum flat space available inside the basket for groceries. The basket feels strong and robust even when full of shopping, giving the customer confirdence to fill it up to the top, maximising spend per customer. Branding is available on a minimum of 100 units. There is the option of a single colour stamp branding or a full colour weatherproof label applied to both sides of the baskets during production.